This recipe makes a tall 8-inch round cake. It's covered in Swiss meringue buttercream, which can be tricky for beginners, so be sure to check out my tutorial here. If you're not a fan of Swiss meringue buttercream (like my mom - c'mon MOM!) then you can substitute a basic confectioners' sugar and butter version (like the one at the bottom of this post). The rainbow exterior is a wall o' Twizzler Twists in rainbow colors. You can find these in the candy aisle at the grocery store, or you can order the required 2 packages here. You can't get much simpler as far as cake decorating goes. 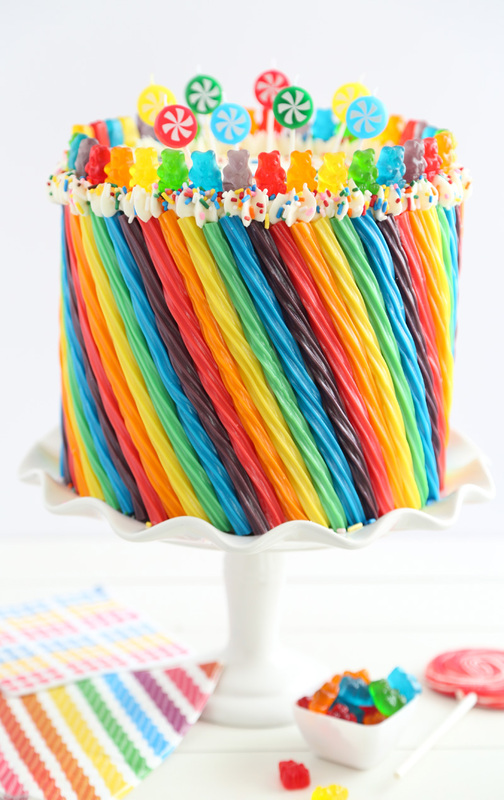 Just line the twists up in rainbow color order at an angle, or you can place them vertically for easier slicing. I served this cake by placing my knife between two Twizzler twists and cutting the cake at an angle. It made for some very interesting slices! 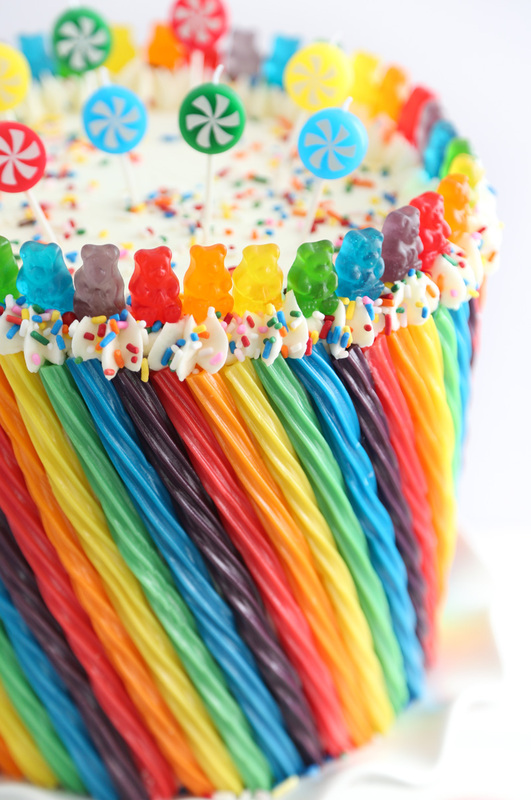 The top edge of the cake is lined with gummy bears in rainbow colors. Now. I'm a Haribo fan from waaay back, but I also love the Albanese brand. I keep a 5 pound bag of the latter on hand because I love how soft they are and also because there's probably something psychiatrically wrong with me. But, whatever. I love gummies, okay?! I picked up the ultra-cute lollipop candles at the grocery store. I can't find them for purchase online, but they are made by Betty Crocker. 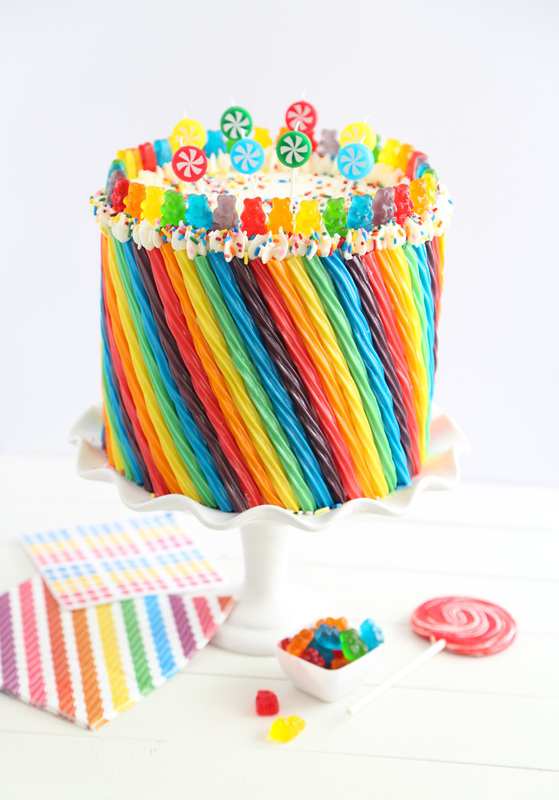 If you can't locate the candles, then I think this cake would also look cute decorated with the real thing: swirly candy lollipops standing upright in the middle of the cake. This cake's flavor reminds me of white cake; a simple but rich bakery-made birthday cake when frosted with Swiss meringue buttercream. Be sure to pick up an extra two dozen eggs (!) while you're grocery shopping. 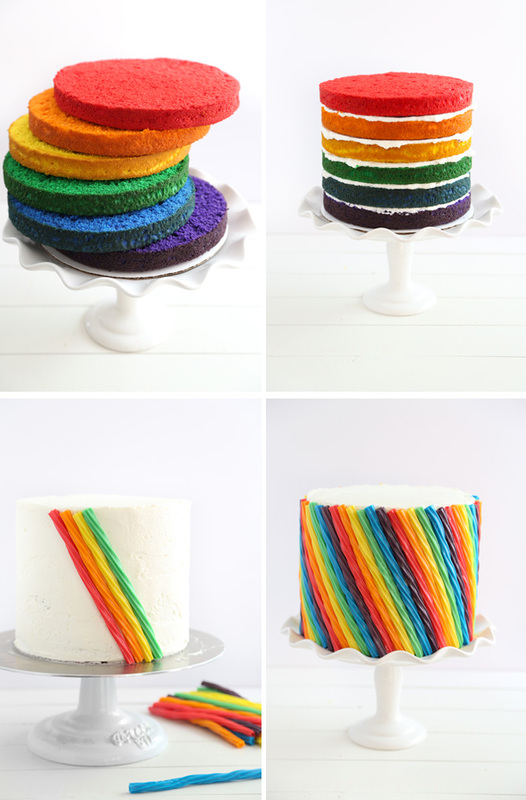 The rainbow cake requires 10 egg whites, and the Swiss meringue buttercream requires 12 egg whites. Make the cake layers: Preheat the oven to 350 degrees. Grease six 8-inch round cake pans, and line the bottoms with parchment. If you don't have six pans (understandably so) use as many as you have, and plan to wash them between baking cake layers. Sift the flour, baking powder and salt into a large bowl. Combine milk and vanilla. Beat butter with a mixer on medium speed until smooth. With the mixer running, gradually add the sugar and beat until the mixture turns pale and fluffy, about 3 minutes. Reduce speed to low, and add the flour mixture in 3 additions, alternating with the milk. Begin and end with the flour mixture. Beat until just combined. Do not over-mix. Beat the egg whites in a clean mixer bowl on medium speed until stiff peaks form, about 5 minutes. Gently fold the egg whites into the batter in three additions. Place two cups of batter in six separate bowls. Tint each bowl of batter with each of the food colors until a vibrant hue is achieved (start with 1/2 teaspoon color and increase as needed). Fold the color in well with a rubber spatula until no streaks of white cake batter remains. Spread the batter into the prepared pans and bake for 18 to 20 minutes. Let the layers cool completely on a wire rack. Run a knife around the edges of the cakes and the pans before turning them out. Level the cakes with a serrated knife or a cake leveler so that the cakes are approximately 1 1/2 inches tall. Save the cake scraps for breakfast or snack on them now (smile). Add the vanilla extract. Beat until the frosting on high speed until it is thick and completely smooth. Important note about Swiss buttercream frosting! After a few pieces of butter are added to the whipped whites, the mixture will deflate. It may look like soup or even look curdled - do not let this discourage you. This is just one ugly stage the buttercream must pass through before becoming fluffy whipped frosting. Frost the cake: Transfer 2/3 cup of frosting to a piping bag fitted with a small star tip; set aside. Fill each cake layer with 1/3 to 1/2 cup of the frosting. Begin with the purple cake layer on the bottom, followed by the blue, green, yellow, orange and red. Cover the entire cake with frosting using an off-set spatula. Decorate! Place a red Twizzler twist against the cake at a 45° angle so that it sticks to the frosting (you can also stand them vertically and trim the tops if you wish). Continue with an orange, green, blue, and purple twist. Carry on in this manner until the cake is completely covered. You will have 3-ish leftover twists left over (snack on them or save for another use). Use the reserved piping bag of frosting to pipe small stars along the top edge of the cake. Position the decorator nozzle so that the icing also covers the tops of the candy twists; Sprinkle top of cake with rainbow jimmies. 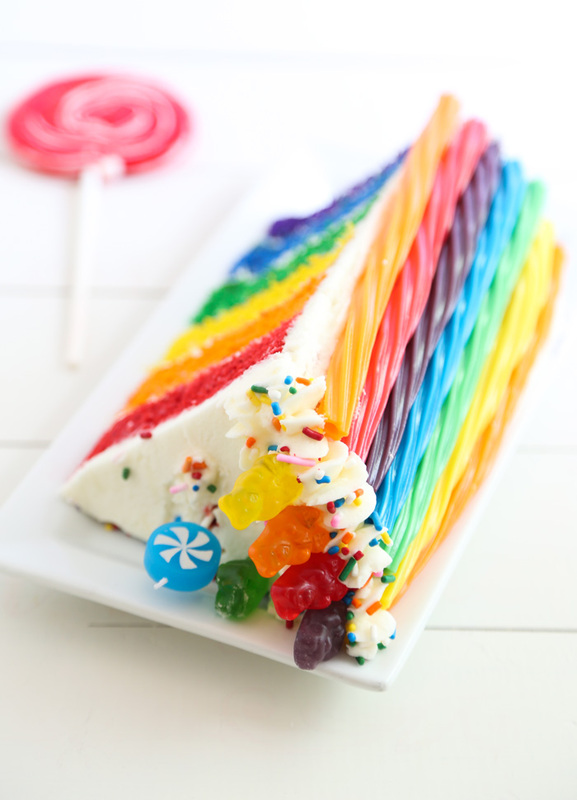 Place gummy bears upright in the frosting stars at the top edge of the cake in rainbow order. Add candles to the center of the cake, if appropriate for your celebration. How to slice: Cut the cake with a large chef’s knife at an angle between twizzler twists. Cover the leftover cake loosely with plastic wrap and store at room temperature. How is it that the slice pictured is such a perfect cake slice? I would think cutting on a angle in between twizzlers would distort the final outcome? Please advise cuz we SO want to make this one!!! How is it that the slice is such a perfectly shaped cake slice? I would think cutting at an angle in between the twizzlers would distort the look of the slice? Please advise since we SO want to make this gorgeous cake!!! Angling the knife between the twists doesn't really distort the cake slices much. You may have to remove one twizzler on one side of the slice in order to get a picture-perfect slice with a pointed end. If you're concerned at all you may consider making a small practice cake or placing the twists upright. Never thought of decorating with twizzlers. Placing it diagonally makes for a double great idea. This should be in a list of "Easy Cake Decorating Ideas". Lovely! its a nice read and pinned it to my pinterest account! looking forward as a reference since i will be opening a small business @ home. (pre ordered cakes) set up a online account for my clients. Im been shopping around for bakeware, so far, shorisuperstore gave me classical deal set that gave me a nod, esp theyre cheaper compared to all other brands.. THIS IS SO CUTE!!!!! I am also a die hard Haribo fan. Cola bottles, gummy bears and twin cherries for life! This cake is amazing - shared and pinned for inspiration later - the kiddos minds would be blown if this was their birthday cake! WOW! Hi Heather! 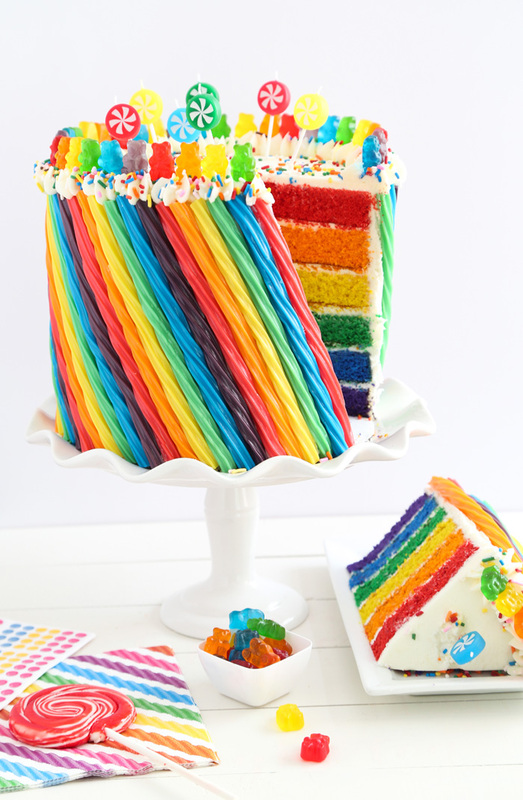 I'm making this cake this weekend for my daughter's third birthday party (she is SUCH a rainbow girl! ), and it's going to be outside, albeit in the morning. Now, I live in Texas, so it will be warm (not hot, but you know). Will the swiss meringue do okay, or should I sub in another kind of frosting? Thanks! I've LOVED making your cakes! I made the chocolate chip cookies & milk cake for my son, and the awesome sprinkles-covered cake for my own! Beautiful looking cake! So, at 1.5" per layer with 6 layers, that means the cake it a little over 9" tall. My Twizzlers are about 8" long so I'm wondering if you found extra long Twizzlers somewhere? Thanks so much.